Midfielder Daniel Royer scored twice, his second coming in the 90th minute, as the New York Red Bulls battled to a 2-2 draw with the Vancouver Whitecaps on Saturday. The Vancouver Whitecaps were trying to make the most out of a disappointing situation. The Whitecaps conceded a goal in the 90th minute and settled for a 2-2 draw with the New York Red Bulls on Saturday. With Vancouver locked in a race to make the Major League Soccer playoffs, securing a point before a sellout crowd of 22,120 at BC Place was good but earning three would have been much better. Defender Kendall Waston scored both Whitecaps (9-9-7) goals off headers but was frustrated after the game. "I would rather win than score one or two goals to be honest," said the big centre back. "Today was a match that was a little bit difficult in the way we didn't perform as how we would have liked. "One point still helps us to continue to fight to get into the playoffs." Midfielder Daniel Royer scored twice for the Red Bulls. On his final goal, midfielder Tyler Adams sent a kick into the box. Royer beat a couple of Whitecaps defenders and chipped the ball past Vancouver goalkeeper Stefan Marinovic. The Red Bulls were playing a man short after defender Michael Murillo was shown his second yellow card for hard tackles on teenaged star Alphonso Davies. The tying goal came off a free kick after Waston was called for a foul after knocking down a New York player while battling for the ball in the air. Whitecaps coach Carl Robinson wasn't happy with the call. "I think it was a dubious call for the free kick," said Robinson. "It's not his fault how big he is." Robinson called the draw "a very good point for us" considering how bad his team played in the first half. The Whitecaps are coming off a stretch of playing five games in 15 days. "The first half I thought we were awful," he said. "We looked lethargic." "After the first half performance, if you would have said we were drawing the game, I would have taken the point." Royer opened the scoring in the fifth minute after striker Bradley Wright-Phillips threaded a pass between two Whitecap defenders. 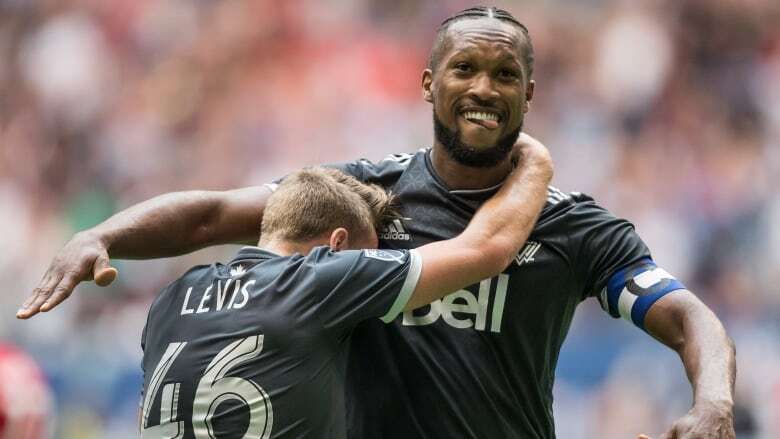 It was the 14th time this season Vancouver has allowed the first goal in an MLS game. Waston tied the game in the 42nd minute off a corner kick from Yordy Reyna. He went high in the air and headed the ball into the net. Waston put the Whitecaps ahead 2-1 in the 60th minute when he directed a corner kick from Felipe into the New York goal. It was his third goal of the season. Conceding goals has been a problem all season for Vancouver. The Whitecaps have allowed 49 goals, the most of any Western Conference team. "It's individual errors we are making," said Robinson. "It's not just one person it's across the board. "Sometimes it just comes down to a lack of confidence in your decision making. I think that's what happened to much this year." The draw moves the Red Bulls (15-6-3) into a tie with Atlanta for first place in the Eastern Conference. New York has just one loss in their last seven games (5-1-1). "It was really important to bounce back and to at least get a point out of this game," said Royer. "We'd been the better team today. I think we controlled most parts of the game." The Whitecaps are undefeated in four games (2-0-2) but with nine matches remaining Vancouver sits eighth in the West. The top six teams advance to the playoffs. "To the end we have to continue fighting," said Waston. "Nothing is impossible. "Now these last games we have, they are all finals. We have to try to get in the playoffs."